The box gives you a taste of each item, so you get to sample one or two cookies instead of buying a whole lot of them. Given the price of most artisanal foods, this is a great way to try new products without committing to a $5 packet of crackers that you might not even like. 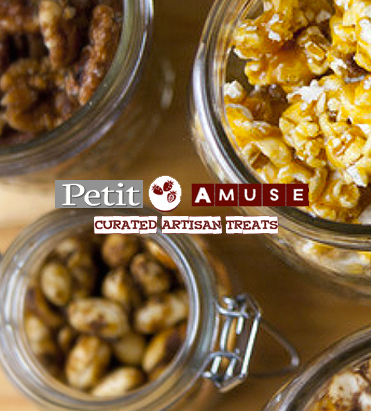 If you enjoy a product, you can purchase it on the Petit Amuse website in a larger size. I also love that Petit Amuse focuses on small producers. When companies are just starting out, it’s hard to distribute their products and gain recognition, but Petit Amuse allows them to reach a wider audience. Their website also offers a great collection of gourmet goods, so it’s fun to just browse (though you’ll probably want to buy everything!). Each product includes a profile of the producer, so you get to know a little more about your food. My sample box offered a variety of products. The first item was ice wine jelly from Caramoomel, which tasted like spreadable sweet wine. It might be hard to get through a whole jar of it, but the sample size was perfect. Next was a Garukabar, a bar made from peanuts, dried fruit, and raw Vermont honey. It was a good snack and I imagine it would be the perfect fuel for a long hike. The box also included two cookies from Lark Fine Foods, a salted rosemary shortbread and a spicy chocolate cookie. The last item was Oogie’s Kettlecorn, which tasted oddly artificial and seemed out of place among the offer artisanal products. Still, the box was a nice assortment of sweet and savory snacks and a good way to support smaller food companies. Unfortunately, Petit Amuse does not cater to food allergies, so if you’re gluten-intolerant, lactose-intolerant, or allergic to nuts, the box is likely to have items you can’t eat. They’re hoping to be able to cater to dietary needs as they expand, so hopefully they’ll be more options in the future. If you’re looking a monthly foodie surprise, I would definitely recommend a subscription to Petit Amuse. Hillary Pollak is a senior at New York University, where she studies sustainable food. She is currently in love with heirloom tomatoes.